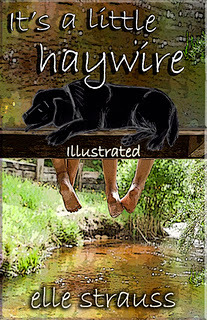 Elle Strauss (link) is a great writer and bloggy friend, and when she asked if I'd like to help promote her latest middle-grade novel IT'S A LITTLE HAYWIRE, I said a big yes! Great news: Today only, it's FREE on Amazon! So run grab your copy here (link), and I'll list it again after Cat's review. I read the book, of course, and loved it. The main character Owen True has a great name, and an equally great voice that pulls you right in. Laura Pauling (link) compared it to Because of Winn Dixie, and I think she's made the perfect comparison. But instead of a boring old grown-up review, I asked my nine year-old daughter Catherine "Cat" to read and review it, and here's what she had to say. LTM: So, Catibug, what was your favorite scene in HAYWIRE? CGM: My favorite scene is the first time Owen ever saw the fog snake because it's exciting, and we don't really know what's happening. That makes it kind of exciting because it's all a mystery. LTM: Who was your favorite character? CGM: My favorite character was Owen True because he reminded me of a good friend of mine. He sounds like a nice guy, and I liked it when he wanted to [help others]. LTM: What was the most exciting part of the story? LTM: What would you tell somebody who was thinking about reading this book? CGM: I would tell them it's a really good book, and that he/she would like it if they ever read it. LTM: Did it remind you of any other book you've read? CGM: It sort of reminded me of A Scary Good Book because they're trying to solve a mystery but trying to accomplish something at the same time. LTM: If you could ask the author a question about the book, what would it be? CGM: I would ask why the main character's name is Owen True and not like Sam or something. And why she decided to write this story. I love hearing a young person's view. Great job, Cat! Wonderful interview and congratulations, Elle! Just read another interview with Elle. This is fabulous. And Winn Dixie...so cool. That was the only book I could get one of my non-reading boys to read, while he was a middle schooler. Wish the book was available for my Nook. It must be, right? All the best to Elle on her new release! Oh, excellent review. Fog snake? What's a fog snake? Now you got me curious, and I really have to read it (it's sitting in my "to read" list on my ereader). So, Elle- how 'bout answering those questions? I'd like to know the answers, too! I downloaded this yesterday--can't wait to read!!!!! Thanks for having me Leigh, and for the great review, Catherine!! To answer your questions: I'm trying to remember,lol. I don't know how I came up with Owen, maybe I was thinking of Owen Wilson at the time for some reason? His last name, True, came to me at Church one Sunday. We were singing a song (sorry don't remember which one) and the songwriter's last name was True. Great review Cat. It sounds like a great story. Thanks for sharing what you liked about it. Great interview. I hope Elle does really well with this. I'm looking forward to reading it. I'll have to send this link to my daughter and see if she's interested, especially at that price! Hi Leigh .. lucky you having Cat to be able to do the review for you - it does make it all the more enjoyable knowing she liked the story line too .. and it does sound interesting .. not sure about the fog and the snake -though I'm sure Owen True will win out ..